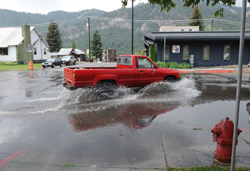 Uncharacteristic for the summer season, torrential rains and hail took Ketchum and Sun Valley residents by surprise last Friday afternoon, flooding streets and some businesses. Starting at about 3 p.m. Aug. 8, the Sun Valley Pavilion was awash with hail and slush, the drywell sewers on Main Street in Ketchum overflowed and water cascaded from the commercial core down into West Ketchum streets. Cars moved slowly in town and pedestrians ran for cover when marble-sized hail and heavy rain started mid-afternoon. A representative from the Ketchum Ranger District said that she measured 0.93 of an inch of rain Monday morning, reflecting all rain since Friday. Comparatively, the previous Friday-to-Monday period had about two-thirds of an inch measured, she said. The district measures rain every weekday morning, so Mondays show all condensation collected from Friday afternoon on, she said. Ketchum Fire Chief Mike Elle said his department responded to complaints of flooding at Silver Creek Outfitters and the 511 Building on Friday afternoon. The department dispatched two engines, a pickup and an ambulance to the sites to help dispel the water, he said. With the city’s drywell sewers, Elle said, “water can’t soak into the ground fast enough” and flooding can occur. Employees of Silver Creek Outfitters had to move quickly to save merchandise from getting soaked. “It was a little bit of a rodeo,” said owner Terry Ring, who said this is the second time he can remember dealing with flooding and heavy hail at Silver Creek. Ring said the adjacent Memory Park became a pond over the course of the hour. There was 3 inches of water in the Silver Creek basement and some 8 inches outside the back of the building, Ring estimated. He said it took his staff three hours to get water out of the basement, but they spent part of the weekend continuing to clean out mud and sand brought in by the storm. The store kept their regular weekend hours despite the flooding, Ring said. Water seeped into the basement of both the Sun Valley Pavilion and the Sun Valley Lodge, according to Jack Sibbach, the resort’s director of marketing and public relations. He cited the need for minor drywall repairs in some parts of the Pavilion structure that aren’t visible to the public. “There was some damage because the drains filled up with hail,” he said. The Sun Valley Symphony’s Summer Music Workshop had a performance scheduled from 3-4 p.m. Friday in the Pavilion, a culmination of a weeklong music seminar for children. Education Director Kim Gasenica said they took a 40-minute break when the hail started coming down so hard that audience members couldn’t hear the performers. Gasenica said they were able to push some of the acts back to a second, 6:30 p.m. evening performance, so all participants were able to perform eventually. The Sun Valley Lodge didn’t experience much more than wet carpets in the basement, which were dried out over the weekend, Sibbach said. “No guests were inconvenienced,” he said. Marilee Hansen’s consignment clothing and furniture businesses “Worth Repeating” and “Worth Repeating Again” on the basement floor of the 511 Building were unaffected by Friday’s weather, she said. “[Water and slush] was almost up to the curb,” Hansen said, but it didn’t cross the sidewalk and filter down to her merchandise.